Today we’re celebrating side sleeping with a mattress giveaway that’s designed specifically for side sleepers – the Nolah mattress! Nolah is a very comfortable all-foam mattress that is focused on side sleepers and sleeping cool – and we have one lucky giveaway winner that’s going to get it for free (winner chooses their preferred size)! In my Nolah mattress review I highlight the feel of the mattress – it definitely has great pressure relief (in my opinion), designed to take away stress on the shoulders and hips. And yes – I laid on the side, and it felt great! The sign of any good mattress for side sleeping is that it aligns the spine well and doesn’t put extra pressure on your joints. Good luck with the Nolah giveaway! And make sure to check out my Nolah mattress review and Nolah coupon while you’re here! I love the way this product was made! I like the material and flexibility of changing the foam pads. I am a stomach sleeper. The mattress features look really swell. I’m a side and back sleeper, would love to win this matresss. I have no plans. I’ve read a lot about the Nolah mattress and would eventually love to have one of these in my bedroom. I did nothing for World Sleep Day in March this year. I think it sounds like a great mattress that would be comfortable for this side sleeper. I would love to win this mattress so hubby and I could have a good night’s sleep! I do sleep on my side sometimes. For world sleep day, I’ll sleep an extra hour. Looks comfortable and well made. I think this is awesome. If I had one of these I would finally be able to get a perfect nights sleep. This mattress looks great! It looks comfortable! I think that the mattress seems comfy. The Nola looks like a great pick! I plan to buy a new mattress…unless I win one today! I really need this because I’m a side sleeper and I suffer from insomnia. This sounds like the ideal mattress for me. I’m side sleeper with arthritic hips and this would really benefit me. I have not tried the Nolah mattress but it looks incredibly comfortable. As far as the holiday :) I’m going to work… maybe I’ll catch a lunchtime nap! I am a side sleeper and have experienced the aches and pains of not sleeping on a good mattress. This mattress looks perfect! It definitely would help me get a good night’s sleep! I think it sounds awesome. Im a side sleeper and have hip pains regularly. I would love it but have one that is sufficient until can afford better. Of course this would be the ultimate to win. Looks comfortable. 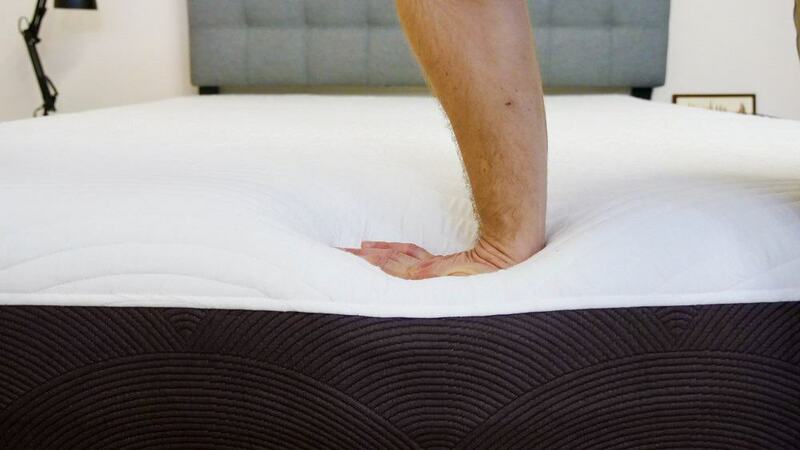 A mattress that eases pressure on the hips AND stays cool is a great idea! I like the mattress in this review. I like to sink in so have 2 gel toppers on our old mattress. I hope it feels better than my temperpedic mattress. Wright Mattress is a nice mattress but too expensive for me. As far as world sleep day goes I think I will catch up on some sleep. I just never seem to get enough sleep mostly due to time but a good mattress is key. World sleep day, I try to make that everyday. I have severe fibromyalgia and multiple neck surgeries, I have not had a good nights sleep in 30 years. I am a side-sleeper that can not get comfortable, I wake every morning with neck pain, shoulder pain from side sleeping, back pain, etc… I NEED a bed that “fits” my situation and will help me get a restful nights sleep. Beautifully constructed bed. Attention to detail. Am a very light sleeper and toss and turn also side sleeper. Would love to win!!!! I had no idea there was a world sleep day. I hope to celebrate it. Side sleepers unite! We need a bed for us that isn’t a one size fits all and it seems like this one is perfect for aligning the spine however you want to sleep. Definitely thinking about a purchase! Need a new one . Dealing with psoriatic arthritis . Be great to get a good nights sleep! Not only does the Nolah mattress benefit side sleepers, it also benefits the environment with its adoption of wildlife program. Sleep well knowing you’re making the world a little less awful. The warranty is also very good. This mattress is AMAZING! The ONLY mattress I buy. I’d love to have a full night and day’s sleep but we have children. Two year olds to be specific! So a restful sleep as much as possible and then up to start the day. I would love to win a new mattress. I haven’t found one that is comfortable since I had surgery on my neck. Would love to win. Haven’t had a new mattress in 24 yrs. Thank you. World Sleep Day didn’t know there was a such thing. I NEED TO WIN THIS CONTEST! Great giveaway!! World Sleep Day….plan to live up to the name. This mattress looks great would love to win! If I won this mattress it would be the best thing that has happened to me in a long time! My mattress is 15 years old so my quality of sleep isn’t that great. I sure could go for a good nights sleep. I could definitely use your mattress. Its got to be better than the 19 year old crappy coil spring mattress we got when we were married! Thanks for the chance at some relief! Really need a new mattress. Would love to try the Nolah. Thanks for this opportunity! I’m a side sleeper and have a hard time getting comfortable. Would love this mattress. I need a new mattress as mine is 21 years old. I’ve been looking at Sleep Number and Tempurpedic beds. How wonderful it would be to win this mattress giveaway and get a good night’s sleep! I’m a side sleeper so the Nolah sounds right up my alley! Would love to try it! Thank you for another awesome comprehensive review with constructive feedback. As a side sleeper, I am now very interested in this mattress. Oh my, this looks so comfy! National Sleep Day, if I’m off work I will literally sleep all day! I’m a dedicated side sleeper who is longing for a new mattress! I used to sleep on my stomach for years and years but I got to the point where I couldn’t breath good. I am an everynight side sleeper now! I’m paralyzed (t4 from my lower chest down) and have to worry about pressure sores also while sleeping on my side. This mattress sounds like the perfect match for me! An all foam mattress will be soft on my pressure points and also be great for my shoulders! I am loving this mattress! This seems like a nice mattress. Would love to win this. I sleep on my side and am always moving to the cool spot on the bed – sounds like the perfect mattress for me! Would love to find a mattress that would let me fall asleep fast. Some nights I am still awake after 2 hours of getting in bed. I sleep on my side and have hip pain. Also my foam topper is foam and is definitely too hot at night. Love to get an email that choose me to get this mattress. It would be a dream come true!!!! ohhhh, my aching back needs this ! This mattress looks super nice, and I love the no disturb out of bed, that is awesome! Need!! Sleeping on couch currently! Thanks for chances! OH…..NOLAH – I wanna sleep with you so bad. Will you let me sleep on you please? My lover and me can’t wait for all the new positions this bed will provide. Both my husband and I are side sleepers, living in a HOT climate. We have an OLD OLD mattress that is hard and causing hip issues for me. We’d LOVE to win the Nolah! WSD – love it! Would love to win this. DH & I have health issues so we’re bed ridden a lot. It’s a must that we have a comfortable bed! I don’t sleep well at night, don’t get a lot of sleep. I would like to try this mattress. It sounds great! I am a side sleeper as well. The bed looks fabulous. And also like it was made just for me! Looks like a solid well made mattress, Had to work on World Sleep Day, but I did take a little lunch time nap on my office……..
Side sleeper or belly. Taking a nice cozy nap ! Side sleeper, taking a nice cozy nap ! I have been a side sleeper ever since I can remember, but do notice a stiffness and pain in joints in my older years, would love to see the difference this mattress could make. I will probably celebrate sleep day with a nap. No plans. I would love that mattress. It’s perfect for me. I am a side sleeper. From the information I have gotten from your site, your mattress sounds like a wonderful choice at a reasonable price. Thank you for sharing. Celebrating Sleep Day is one of my favorite days as good sleep makes life better! I have a plan for “Sleep Day” and its napping on and off most of the day! I like this mattress and believe it will solve a multitude of my sleep issues! always have back pain- current mattress is terrible and I’m pregnant! Would love to win this!!! As a side sleeper who often wakes up in pain, this mattress sounds like a dream. Looks like a nice mattress. The mattress for side sleepers is for me! Aldo. sleeping cool helps, as well! I sleep so hot. I’d love to try this and see if it would help with this problem! I hate I missed World Sleep Day…I had no idea! it sounds very nice, i am a stomach/side sleeper. i need support and a firm mattress. my dogs also sleep with me. I really need a new mattress (25 years old) and have multiple health issues (GERD, heart, etc) and would love to win this for our 50th Wedding Anniversary on June 29th!! I sure need one those beds, can’t afford it on a fix income. It will definitely will help my sleeping. I have fibromyalgia & every night when I get in bed my body hurts so badly. Could definitely use an amazing new mattress to relieve pain. WOW!!! Another great review!!! This mattress would be so perfect for us! Love that you recommend it for side sleepers. It would be perfect! I have no plans for World Sleep Day, other than TRYING to sleep! Can’t seem to do that very well lately! I am a side sleeper, and would love a memory foam topper, but my partner gets too hot when we use one, so this sounds like the perfect mattress for both of us! This mattress sounds like one that might suit me. I’m a side sleeper due to back injuries. Oh goodness,you had me at made for side sleepers and softer than most. I’m beside myself trying to choose the proper mattress for my needs but so tired of sleeping on my couch. Loved the review, I believe one of the best I’ve seen on your position pressure test. Also like the cooler to sleep in even with sinkage, I love the feeling but I get extremely hot easily. I would love my son to try this mattress. He has Becker’s Muscular Dystrophy and needs a really good mattress for his muscles. Maybe I will steal a nap in it while he is at school. Love the pictures too. It show how the mattress hugs the body. Very nice. I really need a new mattress. My back is killing me on the crappy one I have now. This mattress sounds great and so does World Sleep Day! We need one for sure! I would totally love it. I have to have a cool sleeping area to sleep. I sleep mostly on my back, but a lot on my side. I sleep very warm. I generally prefer coil mattresses for the feel, but will consider a foam mattress. I’m 6′ and 160 pounds. What would your recommendation be? My wife’s a side sleeper so I think this would be great for her. I normally sleep on my back but I think it’s because our current mattress doesn’t offer the right support for side sleeping. I will be working that day, so no plans for us. I like that the reviews were good for couples sleeping comfort. I would really like to try this mattress. I’m in the market for a new one, been sleeping on the couch for years. Side sleeper here who likes to stay cool. This sounds like the perfect mattress for me! Thank you for the opportunity to win! This is a fantastically well made mattress. I love the air foam as the top layer. I am amazed at the science that goes into the construction of mattresses these days. I want to Thank You for all these great promotions that you have. I have learned so much and your social outreach is off the charts. Good Luck Everyone!!!! I like that the mattress keeps you cool as you sleep. I might take a nap this afternoon for Sleep Day. I’m a side-sleeper that enjoys having a fan going for cool air, and my wife is an all over sleeper. LOL Back, tummy, side, she’s all over the place and sometimes even sits-up in her sleep, leaning on her elbow. The Nolah mattress would be pretty awesome for a cool, comfortable sleep for both of us. For World Sleep Day, I recently read a sleep tip that encouraged power naps, for overall better health and sleep. So I’d like to try incorporating a power nap, when I get home from work. I prefer sleeping on my side so this would be such a blessing to win! My mattress has horrible springs and im in terrible need of a new one! The Wright mattress looks fabulous and sounds so comfortable. I never knew about World Sleep Day. If ever there was a mattress made for my husband and me, this one sounds like it is IT! Both side sleepers on the lighter side and looking for the right mattress for awhile now. Fingers crossed… and toes for good measure! I would love to have a Wright matress for a beautiful and restful sleep on World Sleep Day. I too am a side sleeper, and I also have Spinal Stenosis and have had two back surgeries. This mattress sounds like exactly what I need. My fingers are crossed. I sleep like a toddler, so the awesome support for side sleeping is great for all of my thrashing. Would love to try this mattress out! :) No plans for World Sleep Day but I’ll try to celebrate with a nap! Such an amazing giveaway and I thank you for the chance to win. I love the review on this mattress and would love to have it in my home. I’m a senior who sleeps on her side and needs a mattress that will provide comfort and health for these “older” bones etc. The Noah seems to be capable of that!!!!! Yes ! I do need a new mattress ! I think this mattress sounds heavenly!! I’m bedridden a lot due to chronic illness so I’m not planning anything special for World Sleep Day. Maybe spend one day reading all day in bed wearing my pj’s. Being a side sleeper, I like the pressure relief and the good spine alignment. To celebrate Sleep Day, of course, I will SLEEP! This sounds like a mattress I need. I’m looking to buy one soon and I’ll have to do more research on this one! I think it’s a really nice mattress and would love to own one ! I have no plans for mattress Day . The Nolah is constructed with three distinct layers of foam, stacking up to 10” of comfort. The bed was specifically designed to appeal to side sleepers, who benefit from the pressure relief of soft, contouring foam. The layers, then, work in tandem to alleviate the discomfort of increased tension at the shoulders and hips. I think the mattress looks great and super comfortable! I need this! I’m a side sleeper who needs a new mattress! No special plans for Sleep Day.. This mattress sounds and looks AMAZING. I need a new mattress and have spent the last month comparing them. My plans for National Sleep Day is to finally buy a new mattress and have the BEST sleep ever on it. I am so hoping to win this. I’m a side sleeper so this would be great for me. I’d love to have this!! Am remodeling a back bedroom and this would be perfect! Thanks for the chance! It looks like it would be really comfortable. I suffer from insomnia and sure would like to find a mattress that I can actually stay asleep on. Loved your review as I need pressure relief (on my hips!) and my hypothetical plans for World Sleep Day would be to actually have a good night’s sleep for once! Mattress looks good. No special plans for sleep day. I sleep on my side so I would love to have this mattress. I don’t have plans for sleep day but maybe the kids will let me sleep in. I sleep on my back since I have had spinal fusion, can no longer sleep on my side as I use to. I surely could use a new mattress to help me sleep better. I love the thought of deep compression support thinking it will help all my creaking bones!!! I have neck issues and vertigo and sleep on one side every night… would love to try the NOLAH. I wish I had the money to buy this bed..My husband is a disabled veteran.I sleep on my side mostly.I know you have alot of entries and I just hope we win one. Maybe Doug could actually get a full nights sleep. This sound like the perfect mattress for me. I am always trying to stay cool when I sleep. What an awesome mattress i always get too hot on memory foam matresses ! I’m a side sleeper too, and this mattress looks like it fits the bill! I appreciate the contest. I really need a new mattress! I’m aside-sleeper & the Nolah mattress looks like the perfect combination of support and comfort. I bet this provides a great nights’ sleep. I plan to sleep in late on World Sleep Day & lounge around as much as possible. Here for the sweeps entry. This mattress looks so comfortable and supportive.I’m sure it could really help me get a better night’s sleep and wake up feeling much better. Because of neck and back pain I have to sleep on my side but I still wake up every couple of hours. Many times this is all the sleep I get. I would love to try this mattress to see if it would ale a difference in the amount of quality sleep I would get. I am a side sleeper and surely could use a cool mattress so I know this one was made for me. Maybe I could finally get a good nights sleep! I need a good relaxing mattress!! Is this one of those mattresses that shows up at your doorstep like a giant dinosaur egg wrapped in a sausage casing? This looks super comfortable! I’m a fetal position sleeper. And I’ll be sleeping that day! Am soooooo reviewing mattresses and soooo considering this one! Can’t wait to hear who wins and if they love it. I like that pressure mapping result. I don’t like sinking to deep into the mattress, but like some softness. I also don’t like to get too hot while I sleep. My spouse and I have some different sleep habits too so I like that this is made to accommodate those issues. world sleeper day and nap day… I love it! I would love to sleep IN my bed rather than ON my bed! Due to a recent accident I have become a side sleeper. This matress sounds great. I hope my kids let me sleep in to celebrate sleep day. Fingers crossed on all fronts! The Nolah mattress sounds wonderfully comfortable — perfect for a great night’s sleep. I don’t have any plans for World Sleep Day later this month. As a side sleeper, this mattress really appeals to me. As for Sleep Day, I hope to celebrate it in the best way possible – with a good night’s sleep! lookzs like it could do the job. Looks like a good quality constructed mattress and great for any type of sleeper. I plan on sleeping on world sleep day! Thank you for all of your reviews. Buying a bed online would not be an option for me without honest reviews, like this. The Wright matters sounds wonderful too. No plans for world sleep day, when I finally get a bed conducive to sleep though I will celebrate World Sleep day all day and night!. I am a slide sleeper. In and Out. I think this is the mattress my husband and I have been looking for! 10 inches of comfort, 3 different foams, ah sounds perfect! This mattress would be great for me. I am a side sleeper. I plan to sleep on World Sleep Day. Being a side sleeper this looks perfect for me. I read many articles that speak of the benefits of a foam mattress that relieves pressure points and this mattress looks like it has the combination of support and comfort for us side sleepers. I would love to evaluate for myself. As a side sleeper, I think I would really love this mattress! I’ve never slept on something actually built for the way I sleep. No plans to celebrate sleep day unless I’m off…then I’ll sleep in. I’ve always slept on my side. I get so hot in bed, which makes me miserable and unable to sleep. This sounds ideal for me then. All my health problems like fibromyalgia and tachycardia make it hard to get to sleep, so I need all the help I can get. With a mattress made for me, as this appears, I would be able to sleep. Yah! This mattress looks so comfortable! So much better than my current one! My husband has has two hip surgeries and I am due to have a hip surgery next month so we can really use a new mattress/ 2 twin mattresses. I am a side sleeper so am jazzed that there is a mattress made exactly for this! I would love to sleep on a cool mattress that can support my body while sleeping on my side. I would love to spend National sleep day in this bed! I often wake up sore and aching pains all over especially my back. I think this would be great for me. I love the Wright mattress! I will definitely be participating in World Sleep Day later this month! Im a side sleeper being it’s hard to sleep on my back and I’m going to celebrate by sleeping in and cuddling with my baby girl to watch movies. Need this for my son’s room! I think he’d love it! I normally get about 6 hours of sleep, so i want quality sleep. The review highlights the build is good for side sleepers…that’s me. Cool foam is a plus. I think I would love this mattress. My wife and I are both side sleepers, so this mattress sounds like it would be a good choice. As for World Sleep Day on Friday, I will definitely be sleeping after the week I’ve had so far. I need a mattress that’s designed to take away stress from shoulders and hips ! This would be so fabulous ! I am in physical therapy right now for a wrist and shoulder injury ! Ty for the opportunity to win my dream mattress ! This mattress sounds amazing ! Like heaven ! Fingers crossed ! Ty for having this awesome giveaway for the Nolan Mattress ! I am so hot at night. So I would love this. I like this is good for side sleepers..My shoulders will greatly appreciate it…All the mattresses seem exceptional and sure would be nice to win one…Good luck all!!! Fingers crossed for another contest!! I love that the mattress is made for side sleepers! Any day I don’t have to be somewhere in the morning is a day to sleep in. New mattress needed. ANd the Nolah seem to possible be it. Need to win to expensive. Might be a bit on the soft side for me – but nicely made..
I’m a side sleeper and would appreciate a mattress made just for the way I sleep. What better way to celebrate Sleep Day than by sleeping late? I like it has 3 different layers. It looks so comfortable. I wasn’t even aware there is a National Sleep Day. I will, however, be sure to get enough rest as always. my back could really use a new mattress. Yes… please… please… please. King size so I can finally sleep the nite away!! Thank You for the chance to win this wonderful mattress!!!! I am a side sleeper and and just told my Husband that I thought we needed a new mattress. I hope this is a omen!!! This sounds like an amazing mattress! Would be so thankful to win it! No plans for national sleep day. This would be great looks comfy. Really enjoy your reviews. My middle son is 22 and looking for a new mattress. I’m a bit ‘old’ and worry about buying a mattress that I haven’t laid on but he’s not concerned about that. Love the comparisons too!! Been a big help! I am loving the edge support and it’s such a beautiful mattress. This mattress sounds perfect for me! I love to sleep on my side but I never can get comfortable on my bed because it causes me so much pain. As much as I force myself to sleep in other positions I still find myself on my side, and in pain. I’d love to have a mattress that supports my habits! The mattress looks great! I’m a stomach sleeper but my husband is a side sleeper. For world sleep day I hope to sleep in! Looks like a good choice for many. Very interested in this mattress! Im a side sleeper and have back and hip pain. Needing a new mattress! I love that the Nolah mattress has great pressure relief and is designed to take away stress on the shoulders and hips. I’m a side sleeper who strives to stay cool, this mattress sounds like it was made for me. My plans to celebrate sleep day include sleeping in as late as possible, and taking as many naps as I can. I’d love to win this mattress. It was one of my top picks for a deliver to home mattress. Definitely a side sleeper here. Would love to give this one a try. I am a side sleeper and toss and turn a lot throughout the night. Would love to have a mattress that would help me to have more restful nights.